Today’s Overview will lead us onto the tracks of another material, as famous as it is unknown : musk. We could have written an article about its origins, its nature, its many varieties and uses, both in ancient and modern perfumery however we deemed it more interesting to delve into its history and, as you might have guessed, its spirituality. One cannot indeed talk about musk without talking about its religious aspect, for there is one thing certain : without Islam, musk would probably never have got as famous as it is now. Musk has never been more praised than in the Islamic world. Although it was already mentioned by Kalidasa in the Ritusamhara, India always valued camphor’s immaculate freshness more than musk’s animalic darkness – you can still read our article about the Perfumes in Vedic India. Which is how we came to ask ourselves : why ? Why is musk so lauded in Persian poetry ? Why is it so praised by muslim philosophers ? Why is it inherent to Islam, so much that one cannot imagine any Muslim ritual without musk, so much that « musk » has become synonymous to perfume ? Together, my fools, let us discover the Esoteric Way of Musk in Islam. We must first acknowledge how very little is said about musk in most literatures. Although originating in the high Himalayan peaks –when it comes to moschus leucogaster- musk is surprisingly seldom mentioned in the Vedas and the overall sanskrit literature. However, it is worth noting that is already was of symbolic importance in the Vedic tradition. Indeed, it was believed that the musk deer, intoxicated by its own smell, would roam the mounts and vales of the Himalayan range to find it, never realising that this most beautiful smell was in fact hidden within itself, thus symbolising Man going after mundane pleasures. As usual in India, the good scent is always the hidden one ; the one within ; the scent of the soul. We shall see that this dynamic of entering one’s soul, of looking within – this metanoia so dear to orthodox writers- is not completely foreign to Islam. Let us just say for now that despite knowing whence it came, musk wasn’t as famous as rose, myrrh, frankincense or any other spices coming from India. When Kalidasa (4th century) mentions it in the Medhaduta, it is only when describing « Himalaya's rocky crest, whereon the scent of musk is never lost ». Around the same time, we found Sogdian letters describing the contents of a shipment to the Middle-East, amongst which was musk. We think that’s the reason why musk was always associated with Khotan, a country close to Sogdia yet far enough to arouse Persian poets’ love for the unknown. For anyone who has read Persian poetry knows about musk and how it was always used to signify an otherwordly beauty, a passion irresistible. « Your hair has filled the whole lane with musk, and your face the whole country with light » says Tirmizi in the 10th century. Masud Sa’d, a century later, will say « No musk of Khotan is like your sweet-smelling hair » and Saadi (13th century) will go on to say, in his Gulistan « Art thou musk or ambergris for I am charmed by thy delicious smell ». Beauty indeed but one doesn’t pertaining to looks. Musk is the fragrance of everything intimate, of a beauty hiding behind the steam of the hammam, a beauty carried by a breeze. It is rather curious to see that musk was so highly considered in Islamic world, considering it was somewhat absent of all other perfume traditions. To understand how this came to be, one must venture into a labyrinth of hadiths. The Qu’ran mentions musk only once, in the sura al Mutafifeen : « They will be given to drink a pure wine, sealed ; the last thereof will be the smell of musk ». This association of musk and wine would later give birth to some of the most beautiful pieces of Sufi poetry about the inherent antagonism between Heaven and Earth ; between humanity and eternity. The pure, or rare, wine is indeed the symbol of the pure Divine Essence, this « wine sealed before Adam » as Alawi puts it. We now know that musk’s preeminence is based on its link with Paradise. The Kitab Ahwal al Qiyama even goes on to say that the walls of Eden are « of silver adobe and golden adobe and their mortar is musk and the dust is saffron ». Al Ghazali quotes a hadith saying that « its ground [Eden’s] is saffron and its clay is musk ». Bukhari at last says that there is a « great mountain of musk and from it flows the river Salsabil ». Let us not forget that the houris’ bodies were supposedly made of « saffron, ambergris, musk and camphor and their hair from cloves ». Islam, more than any other religion, saw a direct link between Heaven and perfume. 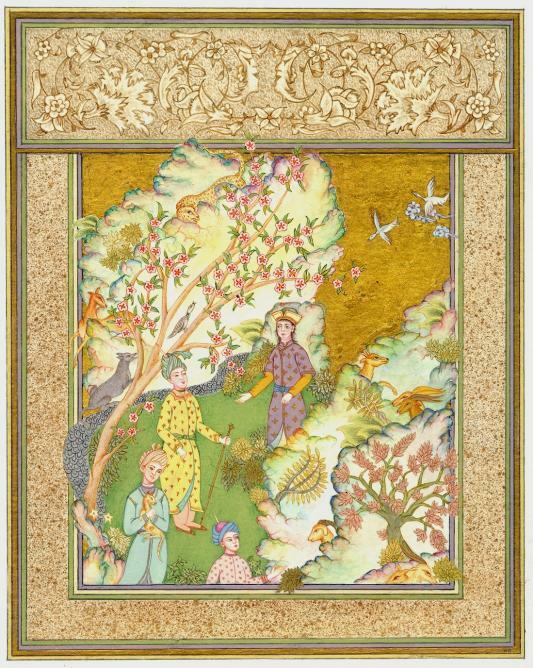 A tradition confirmed by Masudi even goes as far as to say that when Adam was thrown out of Heaven, he fell in India where the leaves of his garment scattered, thus impregnating Indian forests with the lost perfumes of Eden. The lost perfume of Eden – that, my friends, is the ultimate meaning of musk in Islam. For musk, back then, was a sign of sanctity ; of Man’s essence returned to its adamic state, face to face with its Creator. In his hadiths, al Muslim says that martyrs’ bodies will turn to musk in Heaven. Elsewhere, speaking of the blessed ones, he says that they will neither urinate nor defecate but that their bodily fluids will turn to musk and perfume their bodies. This idea is further corroborated by an oral tradition according to which Muhammad’s sweat smelled like musk. Al Suyuti even says that Earth would swallow Muhammad’s feces and that the very spot would smell of musk. Here on Earth, musk is a premiss of the supreme transmutation of matter to spirit. The transformation of sweat and feces to musk would show, on Earth, the power of God, turning the symbol of our mortality and decay into that of immortality. Sufis saw musk as a metaphor of divine redemption, of impure humanity turned pure in the end. By turning its impure blood into musk, the musk deer proved Men that good deeds could be distilled even from the worst actions. For in the end, musk never symbolised anything other than Man’s essence before the Fall. When Ibn al Mulk says that kharjas are the « spice, the salt, the sugar, the musk » of muwashshah, he meant the essence. When Mutanabbi say that « musk is part of the musk deer’s blood » he means the ancestor’s essence lived on in his descendant’s blood. Essence indeed. The pure essence, the true essence, the beautiful essence of a lost humanity ; of humanity before the Fall. It is not the essence of heroes, nor of kings ; but the essence of the poor, the humble, the holy men who, by practicing countless good deeds, got back the essence which flowed through Adam’s veins. The essence of ascets, of sufis, of the exalted. This essence of humanity, in the end.